Though Bodrum doesn’t yet have quite the same cachet as some of the similarly idyllic stretches of coast in the Mediterranean, Kuum Hotel and Spa is a big step toward changing that. With its striking modern architecture, its positively enormous (and enormously inviting) spa, its several seaside restaurants and its DJ-fueled nightlife, the hotel is anything but modest. A glance at some of the available transport options — yacht, helicopter, private jet — should settle the question entirely. And why should it be modest? 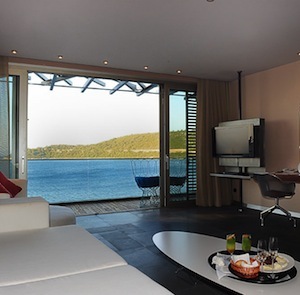 The hotel makes its home on a particularly spectacular rocky cove, surrounded by the Bodrum peninsula’s already gorgeous landscape of rolling green hills and sparkling yacht-speckled bays. 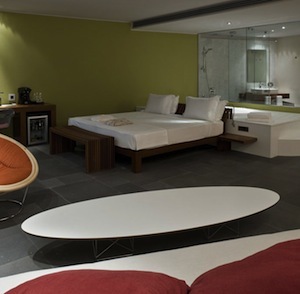 The hotel oozes a casual Aegean glamour, best viewed from the vantage point of the enormous overwater terrace. Fitted with shaded daybeds, a bar and several restaurants, it’s the social nexus of the hotel. And like the aforementioned spa, it’s a draw for guests and non-guests alike. 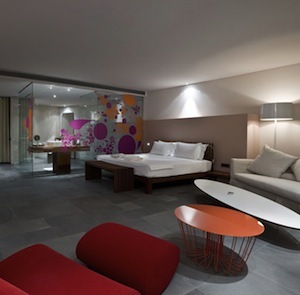 The rooms are a quiet contrast to the buzz of the public spaces (though there are farther-flung hotels for anyone looking for a fully restive escape from the nightlife). The entry-level accommodations are pared down in a way that might feel cold in, say, Fairbanks or Helsinki, but with Mediterranean light pouring in and the wash of color from the blue Aegean on the other side of the window, the cool stone floors and spotless white décor are a complement to the warmth of the surroundings. Every room comes with its own terrace or balcony for closer looks at the seascape, and both the balconies and the views only get bigger as you go up the scale. Please note: Kuum Hotel & Spa is open seasonally from early May through late October. 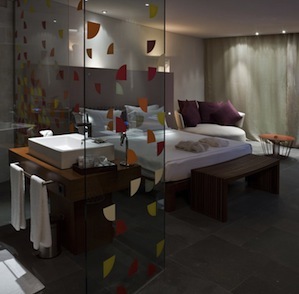 Kuum Hotel & Spa is approximately a 1 hour drive from Milas-Bodrum Airport. Please contact CustomerService@TabletHotels.com for assistance with airport transfers.